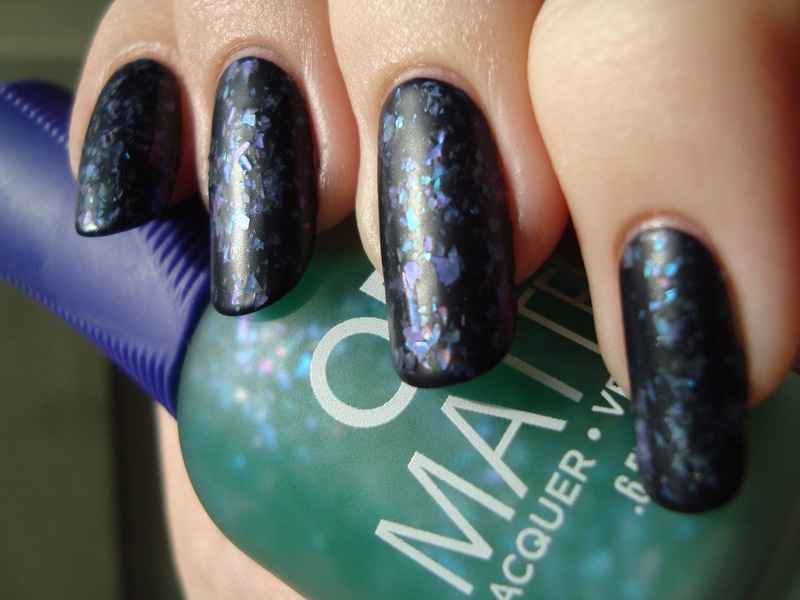 My eyebrows go up whenever I read the word "flakie" and I'm obviously a fan of matte nails, so I was very excited when I saw Beauty Judy's photo from Cosmoprof 2013. I decided to be good and wait until the September birthday coupon was sent to Sally Beauty Club members before buying these two intriguing top coats for myself. It was tough to be so patient, but I finally bought them last week and swatched them the moment I had a chance. 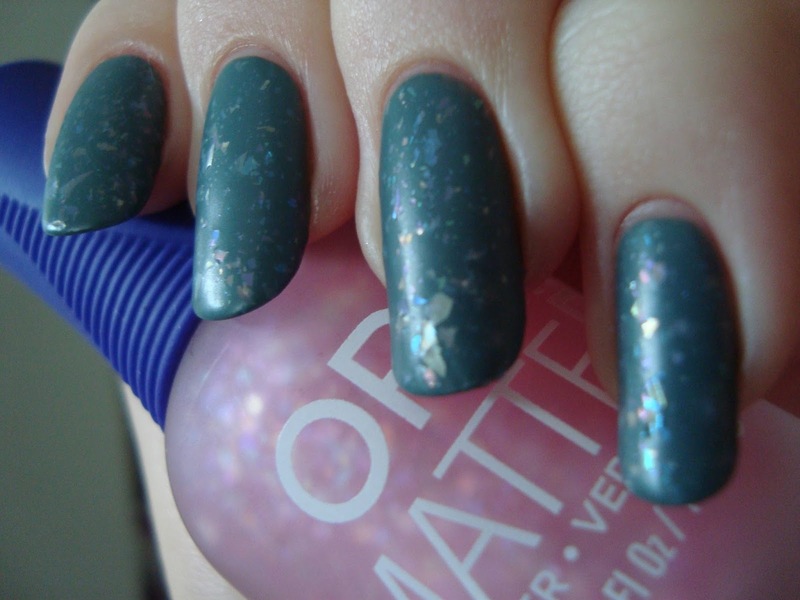 Pink Flakie Topcoat has thin, light colored, iridescent mylar shards in a pink-tinted base. Pink is the less dense of the two. I'm almost tempted to call the shards a "pastel rainbow", because there's a little bit of pretty much every color here. The variation in size, shape, and color makes the effect really lively. 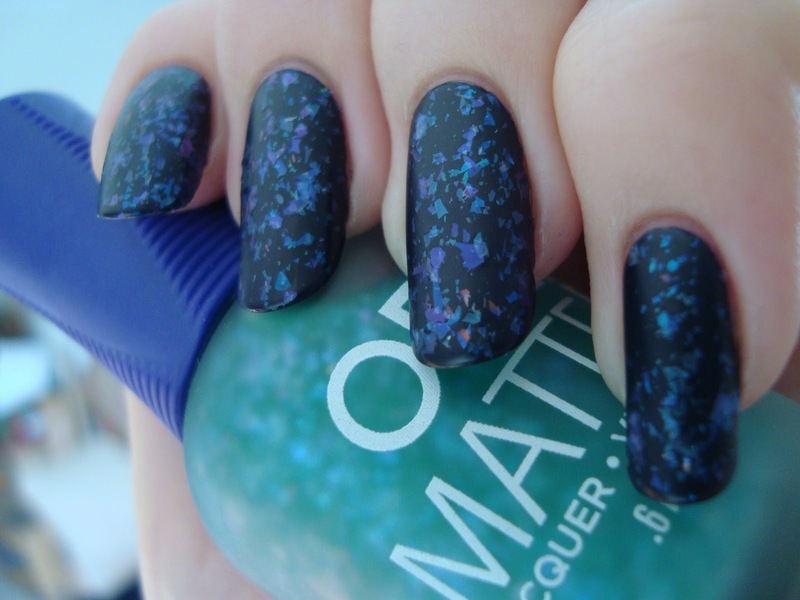 The tinted base doesn't affect the appearance of the polish under it all all. It's really just there to set the two apart in their bottles. The overall look isn't really pink at all. Even though they're meant to be worn matte, I had to gloss up just to see. 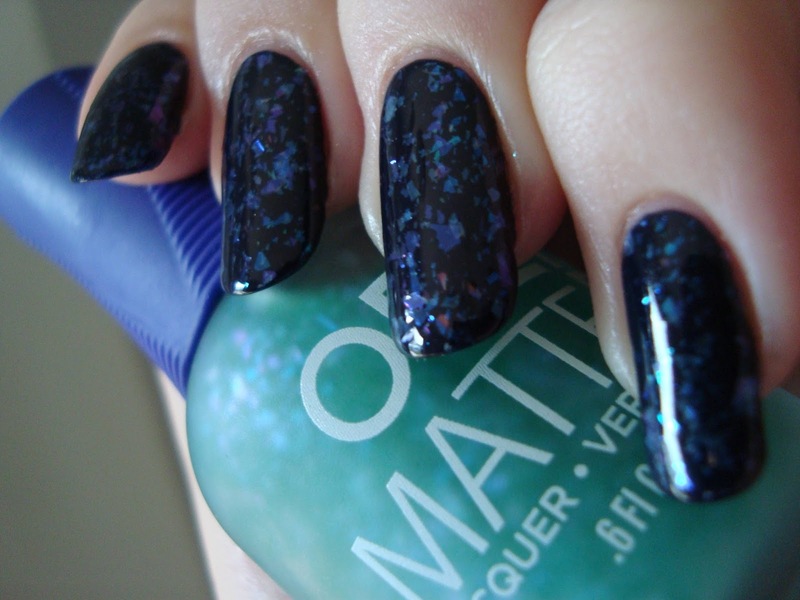 I do mattify glossy polishes a lot, after all. I like Pink as-is, but I really love it glossy. 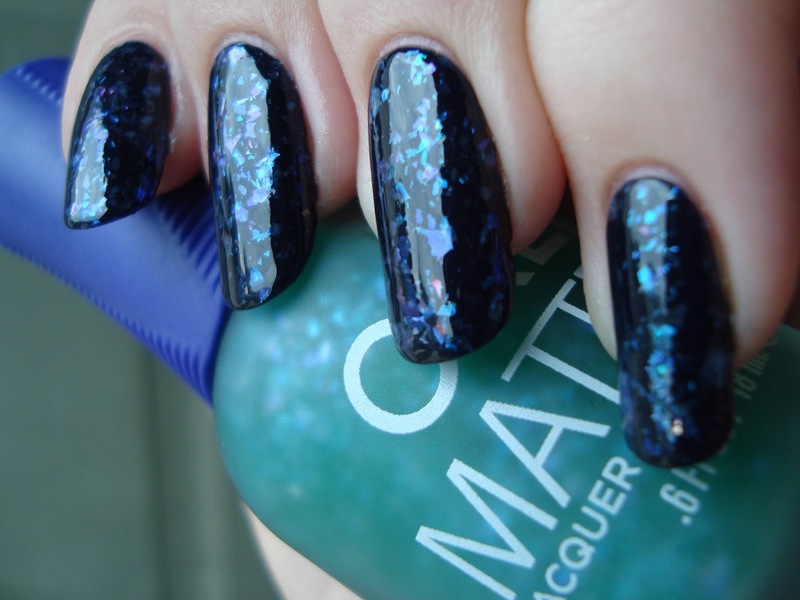 With top coat on, it plays a little trick. The shards become both more and less obvious, depending on the light level. Just look at all of these colors that come out in lower lighting. Top coating also brings out the super tiny shards I mentioned before and highlights the sheer, iridescent beauty of all of these bits. 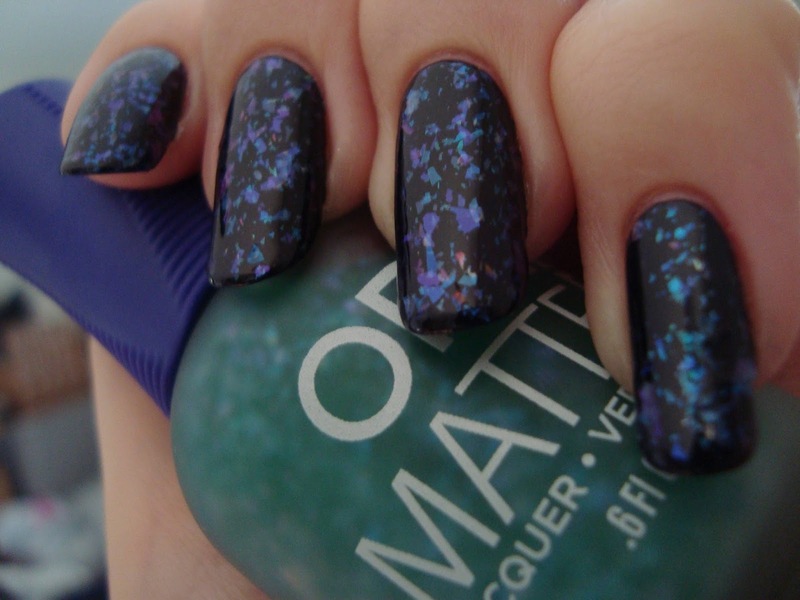 Green Flakie Topcoat has a green-tinted base densely packed with thin, iridescent Mylar shards in cool tones. Just like Pink's name refers more to the tint of the base than the shards themselves, there isn't a ton of green-ness here. Blue, teal, purple, and fuchsia....but not green so much. 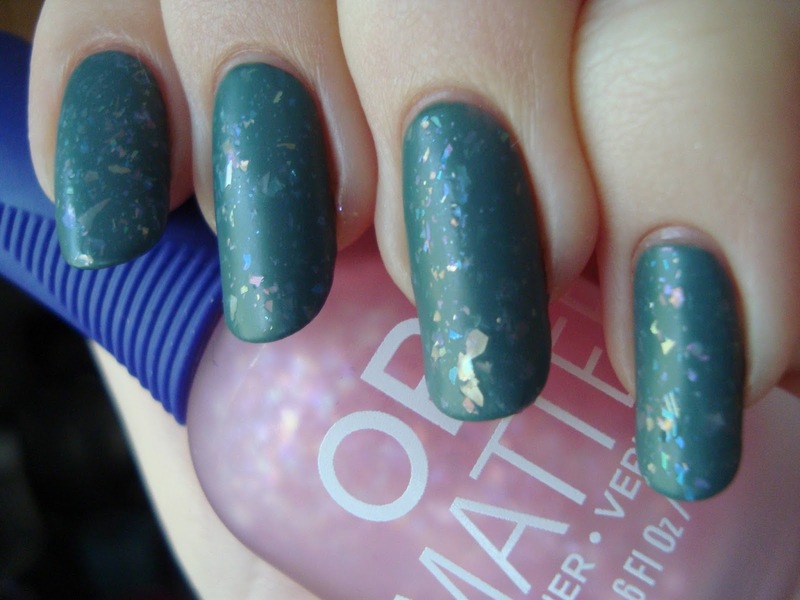 I kinda feel like Green is the more refined sister of Sinful Colors Green Ocean. 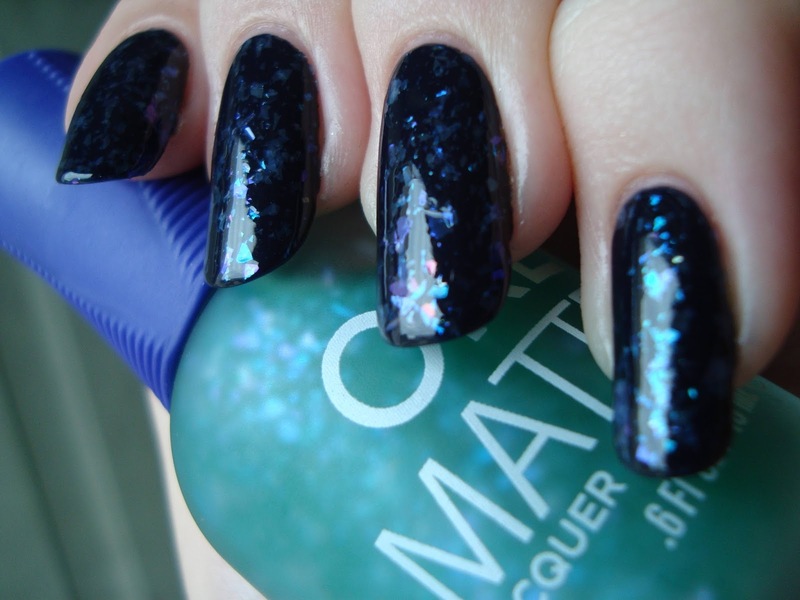 It doesn't have the round glitter, it's well-behaved and smooth, and it's got more color-play. I love the subtle hints of orangey pink it flashes sometimes. Everything that's already great about Green just gets boosted when it's top coated. Green manages to be much denser than Pink without being chaotic, since the colors are much more unified. Tough not to just keep showing you more and more photos of Green. Is it obvious how smitten I am? Ok...one more in a lower light that flatters it, but not me. Please focus on all the pretty shards and not my fingers looking odd. 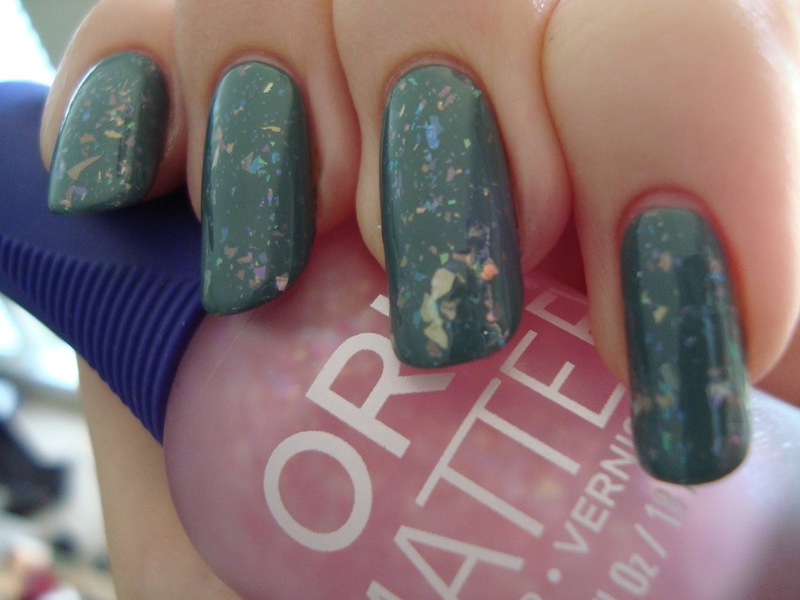 Bottom line: I have a fair number of shards and flakies, but Green and Pink both stand out in my collection. 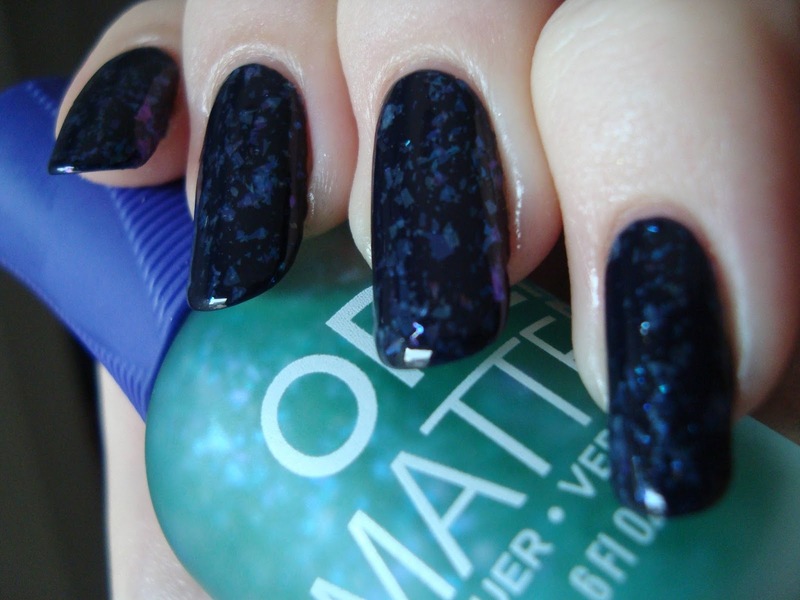 It isn't just their matte finish that sets them apart. They're also easy to apply if you take it slow and they're considerably smoother and less poke-y than other shards. 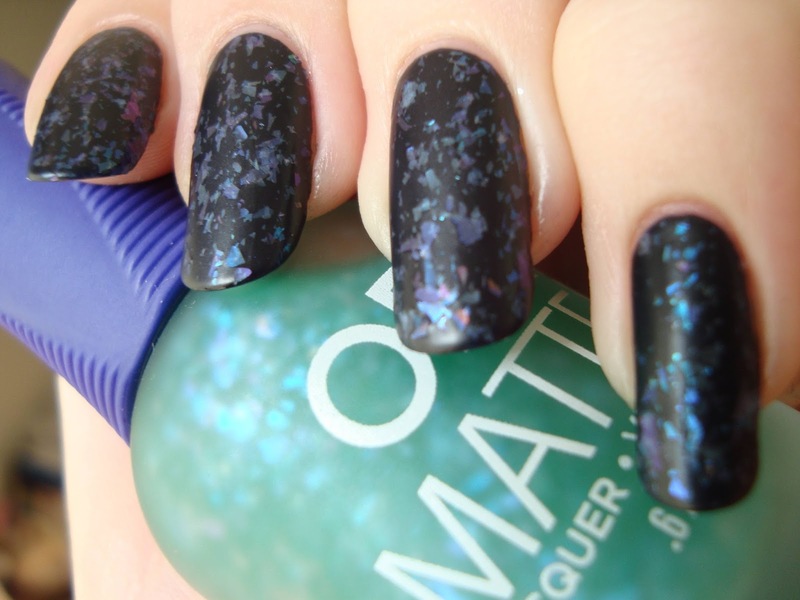 If you're looking for variations on Essie Shine Of The Times, these aren't it...but if you're looking for layering standouts with a lot of character, you'll want both of the Matte FX Flakie Topcoats. It's hard for me to even firmly take sides and pick one. Both. I love both. Little bit of dazzle for your Monday, and a lot more to come this week! I've been a bit scarce the past couple of weeks, but a few fairly big swatching posts are juuuust about done now. Little bit of everything this week. Creams, shimmers, glitters, foils...Essie, China Glaze, Sally Hansen... Fall is only just getting started and there's already so much great polish!